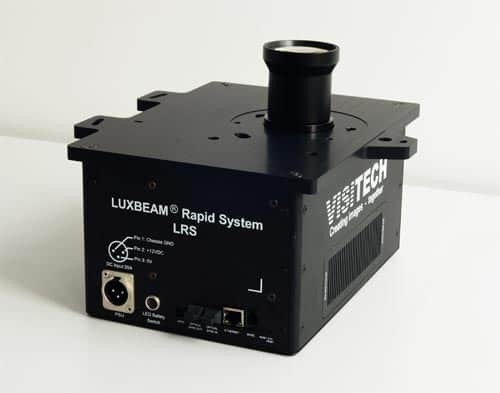 The LUXBEAM® LRS-WQX product line provides robust light engine configurations for advanced high speed industrial implementations, comprising the very high resolution DLP9000X WQXGA (2560x1600p) DMD micro displays and its high-speed streaming controller, and comprising the same highly efficient optical core as the other Visitech platforms. Based on Visitech’s advanced performance LB9500 formatter board configuration and spectrally optimized light engines (either for visible or for UV), binary patterns can be displayed at exceptionally high frame rates (up to 15.000 Hz) for a multitude of industrial implementations. Structured illumination including advanced implementations with scrolling, subpixelation (SPX) and pixel power control (PPC).